Truffles NC Black Truffle Products and Information: Retired from Truffle Farming!! Yes, as strange as it feels and sounds, I am retired from the farming chores of truffle growing. I'm settling in to my new home in Winston-Salem and -- honestly -- loving it! Late in 2016, finding no truffles and feeling a little disappointed in all the work and money invested with so little financial reward, I started thinking seriously about how I wanted to spend the next 5 years. It took some time to really consider how much energy had gone into the project -- 17 years worth -- and whether or not I wanted to do it for another 5 years. The honest answer was NO. Soon thereafter, a buyer came on the scene who had no interest in truffle farming but just wanted the house and land. The deal was done in late February and I thought the farm was put to bed. Then, the buyers came back and said, "well, if you can give us some direction and bring your dogs to help find the truffles, maybe we can keep it going." That was music to my ears. I thought, "I still will have access to whatever truffles get harvested there without having to do the pruning, tilling, etc., etc.' YAY!! So, the short version of the story is: Stay Tuned. We may have truffles yet! It's truffle season in Australia and I can't wait to taste them! Soon I will have them for sale! 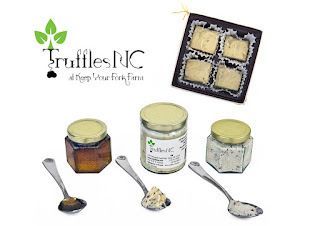 The Truffles NC products will remain for sale in all your Whole Foods stores in the south region and hopefully there will be new outlets soon. Great to hear things are going so well for you!